Gridiron football, also known as North American football or, in North America, simply football, is a football sport primarily played in the United States and Canada. American football, which uses 11-player teams, is the form played in the United States and the best known form of gridiron football worldwide, while Canadian football, featuring 12-player teams, predominates in Canada. Other derivative varieties include indoor football, football for smaller teams (most commonly eight players), and informal games such as touch and flag football. Football is played at professional, collegiate, semi-professional, and amateur levels. At all adult levels of the game, a game is 60 timed minutes in length, split into four 15-minute quarters. (High school football uses 12-minute quarters, and the general rule is that the younger the players, the shorter the quarters typically are.) 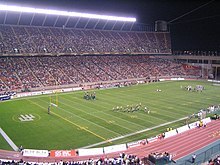 Because of the halftime, quarter breaks, time-outs, the minute warnings (two minutes before the end of a half in the NFL, three minutes in Canadian football), and frequent stoppages of the game clock (the clock stops, for example, after every incomplete pass and any time a ball goes out of bounds), the actual time it takes for a football game to be completed is typically over three hours in the NFL and slightly under three hours in the CFL.